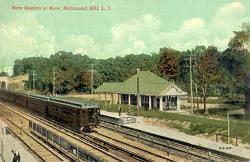 As part of its deal for a direct right of way, the Long Island Railroad opened a new station on September 8, 1910 called "Kew" - a name one newspaper ridiculed. Using the new East River tunnels, trains could reach Penn Station in only 15 minutes. 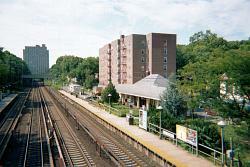 Residential development of the area became inevitable. In 1912, Kew separated from Richmond Hill and was renamed Kew "Gardens", inspired in part by its namesake in England and in part by neighboring Forest Hills Gardens. 1910 Newspaper Article Ridiculing the Name, "Kew"